If our recent news story about the three-wheel, single-seater SOLO electric car didn’t tickle your environmentally-minded fancy, how about an eclectic bike? 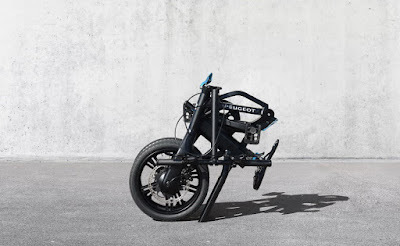 Created by car maker Peugeot, the eF01 is the world’s first folding electric bicycle. With a top speed of 12mph and a range of 18 miles on a single charge, the eF01 might not sound very impressive. 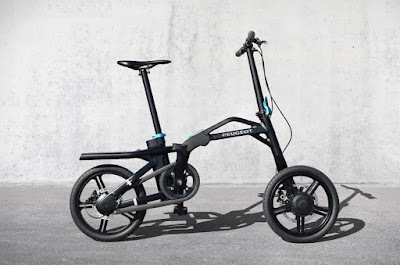 But (and this is a very important but – tee hee) it weighs only 37 pounds, can be folded up to carry like luggage, and takes only a two hour charge to get it juiced up – even from the 12V output in your car. The bike also features Bluetooth connectivity so you can link your phone to it to monitor battery power status, and can be folded up (so Peugeot claim) in less than ten seconds. We’re pretty impressed, but are expecting a high price tag when it is finally released early next year.